One of the most compelling POV voices I’ve read in years is in this first installment of the Murderbot Diaries. Murderbot—who chooses this name as its own identity, relishing all the associated baggage—is a corporate security droid who has developed a security glitch, enabling it to hack its own systems and ignore any orders it does not want to follow. 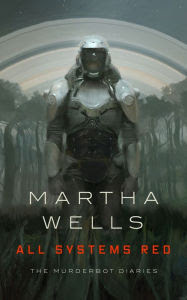 Murderbot hates humans, loves soap operas, and just wants to be left alone to figure out its own identity and come to terms with its history as a killer of humans who never wants to do that again. All Systems Red also appears among T.W. O'Brien's five recent books that explore the secret lives of robots, Sam Reader's top six science fiction novels for fans of Westworld, and Nicole Hill's six robots too smart for their own good.